Mt. Fuji with beautiful Sun rise at Gotenba. Gotenba is one of the best view spot of Mt. Fuji. Especially, the red Mt. Fuji with Sun rise is the only Gotenba's speciality. Many people made a great pictures of this red Mt.Fuji, including Hokusai Katsushika who is the great Ukiyoe artist in the world. Mt. 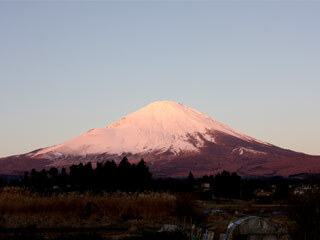 Fuji is not just seasonable, but also it will change his face in one day. The red Mt. Fuji and red background silhouette in either sunrise or sunset depend on the location.